I arrived in Phoenix at 2200 local time yesterday, after a gruelling 22 hour journey from Falmouth. The security checks at the BA gate at Heathrow were intense and I would advise anyone thinking of travelling to the USA to think twice about it unless the journey is really necessary. Each passenger on the packed Boeing 747-400 was subjected to a body search and thorough hand-baggage inspection, which delayed the flight by an hour and a half. Finally picking up my baggage, after an interminable wait at Phoenix immigration, I met up with Industrial Minerals’ Mike O’Driscoll and Ismene Clarke and shared a taxi to the Hyatt Regency Hotel. After a few hours' sleep, I was up and about in a jet-lagged state at 3am looking forward to the day ahead. After venturing out into a cold and wet downtown Phoenix, I called in at a local café for breakfast, which should keep me going until the end of the week (thank God I brought my own coffee out with me though! ), and then called in at the convention centre for early registration. The exhibition is slightly bigger than last year in Denver, with 630 booths, compared with 603, and over 3000 delegates are pre-registered, so final numbers are likely to be about the same as last year (over 4000). The exhibition was formally opened in the late afternoon. I spent an hour there but only found one minerals engineer that I recognised, Pejman Oghazi of Lulea University, Sweden, who will be presenting a paper tomorrow, and also at Comminution ’10 next month. I am currently exploring different tools for DEM of mills. So far I am looking at Paul Cleary's work at CSIRO in Melbourne and Millsoft (Raj Rajamany at University of Utah / PERI). John Herbst / Metso also have developed the capability but this doesn't seem to be readily available. At a simpler level there is Malcolm Powell's MillTraj, and the Molycop tools. There will be a Positron Emission Particle Tracking (PEPT) workshop during the Comminution '10 conference in Cape Town, but I assume this method is probably still in its infancy? Is anybody aware of other DEM capabilities anywhere ? Any experiences with them ? Good ? Bad ? Ugly ? An unrelated question is : it appears that so far really only liner manufacturers have used this kind of tool to market their wares. Is anybody out there on site or in company headquarters using DEM ? If so specifically what for ? The very full programme for Comminution ’10 is now almost finalised. Over the four days in April, 75 papers will be presented by authors representing industry and academia from 20 countries. Already around 80 delegates have registered, and we have only 3 more exhibition booths available in the coffee and lunch area. A company which is completely new to us, DMM, has just become our 7th sponsor. DMM is a South African company, active in the field of wear resistant ceramics, producing a range of ceramic micro beads with different compositions, densities and sizes for use in ultra fine grinding applications. Their market focus is on the high volume users, with specific emphasis on stirred mills such as the ISA and SMD systems. Full details of the programme, registration and accommodation can be found on the conference website. This time next week I will be at the SME Meeting in Phoenix. My first SME Meeting was Denver in 1987, and then in the following year my only other visit to Phoenix. I’ve lost count of the number of SMEs I have attended, in Denver, Salt Lake City, Reno, Albuquerque, Cincinnati, but Denver is my favourite SME city, not just for the nearby ski resorts but also for its pleasant downtown area, particularly the 16th Street Mall. There is always a feeling of déja vu with SME Meetings. No matter where they are held, they resemble large set pieces- the same impersonal registration booths in identical characterless convention centres, a large exhibition and a bewildering array of parallel sessions. They are not exactly fun meetings, as the IMPCs have been in recent years, but, like the IMPCs, they are essentially great meeting places, the technical papers (in my opinion anyway) being secondary. I only spend a couple of days at the meetings, and most of my time is spent strolling around the exhibition booths, catching up with old friends and always having a few surprises, bumping into old acquaintances from the past. I will at the meeting Monday and Tuesday, so if you are going to be there, please let me know, and we may bump into each other! Barbara and I walked the magnificent Penhale Sands this afternoon, at Perranporth, less than 20 miles from Falmouth, on Cornwall’s rugged north coast. Perranporth’s history is a mixture of mining and its association with the patron saint of Cornwall, St Piran. The author Winston Graham lived in Perranporth for many years and his famous Poldark novels, which were televised, are based on the history of the area and its local families. "Hendrawna Sands" in the novels is Perranporth beach. The splendid beach of golden sand is 3 miles in length but for minerals people it is the cliffs that are of great interest. Evidence of the intense 19th Century coastal tin mining activity begins at Perranporth, and stretches westwards to Land’s End. 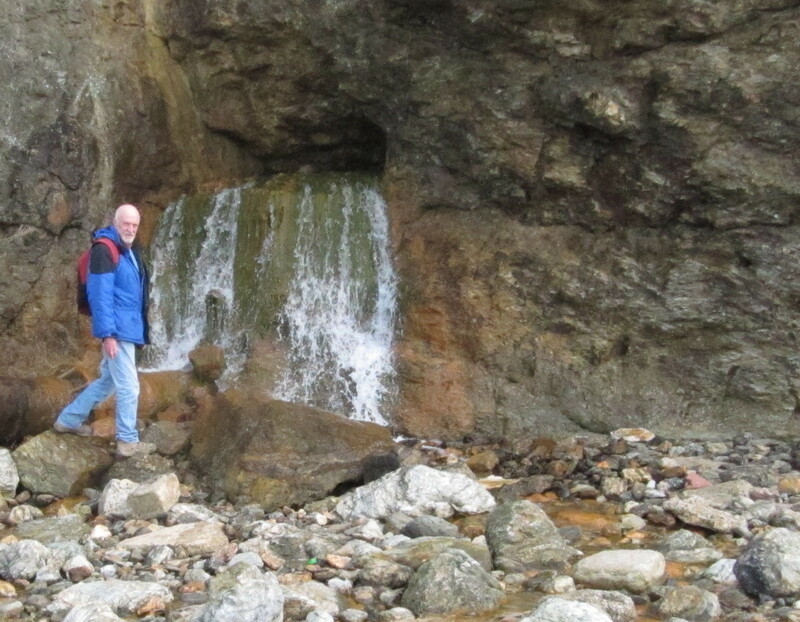 The cliffs are full of the relics of the mining which took place here. Look out for the many holes cut into the rock, which are known in Cornwall as adits, and were created by hand to drain the many nearby tin-mines. Igor Elias, of Scanalyse Pty Ltd, Chile, has formed a new group on LinkedIn. The main focus of the group, Grinding Mills Technology, is to provide a space for discussion of the most common topics related to SAG and Ball mills operations, maintenance, liner design and grinding circuits. So if you are not already subscribed to the excellent LinkedIn, I would recommend that you do so, and don't forget to join the Minerals Engineers group too. The subscribe by email box at the top of the right hand column is now up and running. By adding your email to the box you will receive an alert each time a new posting is added to the blog. 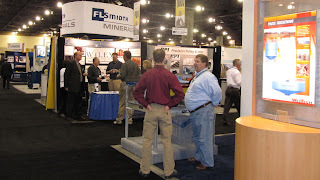 I was pleased to see that the two Mining Magazine Awards for 2009, in the mineral processing sections, have been won by sponsors of MEI Conferences. The Capital Equipment award was won by FLSmidth for the FLSmidth Minerals SuperCell. FLSmidth are sponsors of Flotation '11. The Ancillary and Analysis award went to ABB for their System 800xA control system. ABB are sponsors of Comminution '10. Full details of the awards can be found in the January/February issue of Mining Magazine. An interesting little article in the Australian-based web site Minerals Processing highlights some of the challenges facing mineral processing at the moment, some of which will be addressed at forthcoming MEI Conferences. Damian Connelly, an engineer at Minerals Engineering Technical Services (METS) discusses how the Global Financial Crisis has had a major impact on the mineral industry with a sharp decline in commodity prices and profitability. Banks are more cautious lending to new resource projects following the global financial crisis. They also require better researched and optimised projects with more robust economics before approving project finance. There is little doubt some form of carbon tax will be introduced and our energy sources will have to change. Energy is a major cost for processing minerals and the comminution processes we use are inefficient and large consumers of energy. The development of new grinding technologies is long overdue (these topics form an important part of the programme for Comminution ’10). There will be an increasing trend to hydrometallurgical processing and a decline in pyrometallurgical processes. Desalination as a water source for processing will become more common for projects. The tougher environmental constraints being placed on new projects will mean that some projects will not be allowed to proceed on environmental grounds. Exploration activities will be curtailed in sensitive areas and even excluded altogether. Water is going to become a scarce resource and access is going to be difficult with an emphasis on conservation and re-use. Social and Political issues are impacting on new projects like never before. The common cry “not in my back yard” makes it more difficult to win hearts and minds and gain acceptance for new projects. Mining companies will be called on more and more to provide schools, hospitals and services where governments fail to do so particularly in impoverished areas. Mining projects are only now starting to implement sustainability policies and understand the full impact of such policies. The mining industry could become a global leader in sustainable development (the subject of next year’s SRCR ’11 event). Although I have been involved with the international Minerals Engineering conferences since 1991, the early events were organised by CSMA, the consultancy wing of Camborne School of Mines. 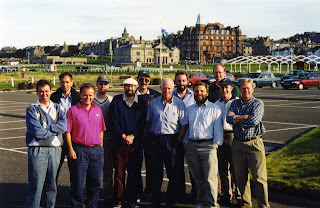 I parted from CSMA in 1998 and the first MEI conference, Minerals Engineering '98, was a memorable event, and our only conference to date held in Scotland. 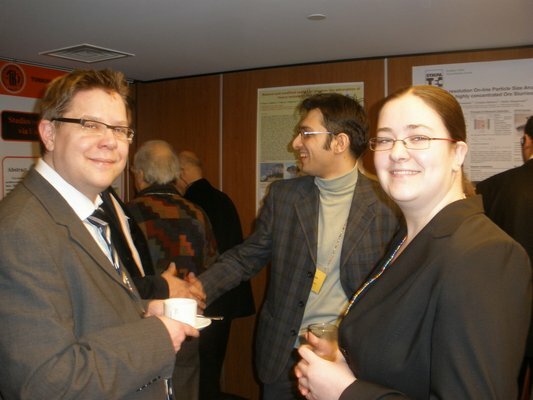 It was also Amanda's first MEI conference, before she joined MEI in 1999. 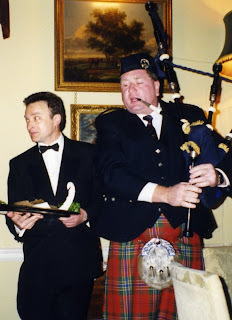 My most vivid memories are of the 'piping in of the haggis' at the conference dinner (left), the golf tournament at St. Andrews, and the visit to Glen Turret, Scotland's oldest malt whisky distillery. 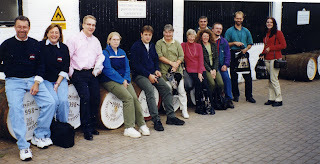 Do any of you have any memories of this event, or can identify the people in the photos (don't forget that if you click on a photo you will get the high resolution image)? 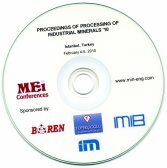 The CD containing papers presented at the recent Processing of Industrial Minerals '10 in Istanbul is now available via MEI Online. Photographs taken at the event are also now available for viewing and downloading on the conference website. 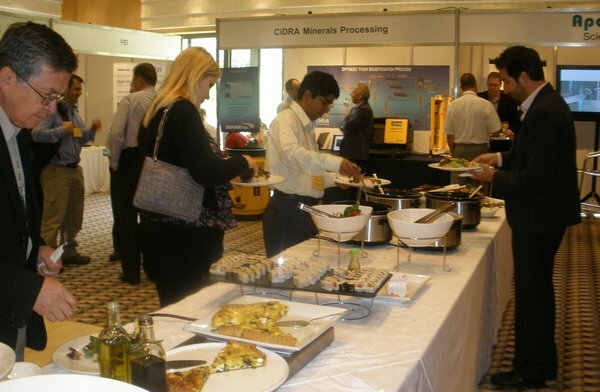 The next conference in the series, Processing of Industrial Minerals & Coal, is provisionally scheduled for 2012, and will be held in the Middle East. Istanbul is a possible option again, but if anyone has any suggestions we would very much like to hear from you. Although I am beginning to wish that I hadn’t, almost a year ago I opened up a long debate on the blog on climate change and the effect that it might have on the minerals industry. The debate was primarily initiated by a series of emails that I received from a South African academic, who was very pro-anthropogenic global warming (AGW) and criticised the scope of the MEI Conference Climate Change and the Minerals Industry ’11 (blog of 22nd August). Since then I sense that the consensus has swung towards the non-AGW lobby, and the strongest voice arguing for AGW on this blog is Stephan Harrison, who had agreed to be one of our speakers at next year’s event. I know that Stephan is totally sincere in his belief that global warming is human-induced, and that he is a highly competent scientist. I have been browsing through various LinkedIn group discussions and find that even on the Climate Change groups the swing is towards non-AGW. A very long discussion (Climate Change- Fact or Fiction) can be found on the Think Green group, and an even longer one (Has Global Warming Ended?) on the Green group. "Those of you following the real science will know that this is the biggest and most expensive scam ever perpetrated on the human race. The chicanery, professional corruption and downright fraud associated with this will eventually be totally exposed; meanwhile the bluster and unethical cover ups will continue to obscure the facts. As professionals whose industry will be significantly adversely affected by the proposals to counteract this non event we all ought to add our comments to the multiplicity of pseudo scientific articles polluting the web. We can't match the histrionics of the green religion crowd, but we can still be advocates for truth and supporters of the true scientists who are exposing the fraud." There are over 40 comments on this discussion almost all agreeing totally with Neville and his almost evangelical views on the "truth" and “real science”. I commented on Stephan Harrison’s proposed keynote speech and my quest to find a speaker to give a counter-argument to Stephan’s views, and Neville responded with “..there is overwhelming evidence of bias against the presentation of evidence to disprove AGW.... The last thing we should be doing is adding our weight to that bias by giving a platform to a known 'the science is settled' proponent like Harrison." "I find it simply amazing regarding the amount of time and effort that those in our industry are expending to fight the idea of climate change and emissions trading. You don't have to believe in climate change. The only thing we should do is focus on becoming more energy efficient. By reducing our energy intensity we increase profitability. The added benefit of reducing CO2 emission is a savings account against the possibility of potential emission trading programs." I agree totally with Gregg on this. I am a climate change agnostic- basically I do not know what to believe, as the problem is so complex, and there are even doubts as to whether global warming is actually occurring, so I keep asking questions. However, the arguments are becoming very emotive, abusive in some cases, and seem to be going round and round in circles. Politicians huff and puff about human induced CO2, but when it comes to the crunch, as Copenhagen showed, they won’t do anything about it. • The economic impact of carbon emission controls on the industry. • Case studies of existing methods to reduce emissions and new technology being developed, such as carbon capture and storage. • Efforts to reduce energy consumption in mining and mineral processing operations. will now be incorporated into the conference Sustainability through Resource Conservation and Recycling ’11, which will be extended to 3-days, and held in Falmouth from May 10-12, 2011. The very strong international programmes for Precious Metals '10 and Nickel Processing '10, which will be held in Falmouth, UK, in June, are now available for viewing. If you would like to present a paper at either of these conferences, which run back to back, please submit short abstracts as soon as possible. Precious Metals '10 is sponsored by Barrick Gold, Newmont Mining, and Maelgwyn Mineral Services, and Nickel Processing '10 by Xstrata Process Support. Thanks to everyone who responded to my blog on how to produce an awful PowerPoint presentation. Now here's another question. What makes an awful oral presentation? Obviously the PowerPoint presentation plays a big part, but leaving aside the illustrative tools, what turns an audience off in a big way? Again I would like your views, as they will be used as a guide to MEI Conference presenters, but I would like to put forward my own number one source of irritation. My prime irritant is the arrogant presenter who feels that he can take as long as he likes to make his presentation. I am sure we have all experienced this. We are sitting there gasping for a cup of coffee, in the rapidly dwindling coffee break, while this person comes to the end of his allotted time, nowhere near his conclusions and totally oblivious to the pleas of the chairman to wind up. If the chairman is ruthless and cuts him off, he invariably complains afterwards that it is impossible to explain his particularly high quality piece of work in so short a time. Rubbish!! The real reason is that he is selfish and unprofessional, and also totally lacking manners, being completely oblivious to the feelings of the next presenter, who may be a young debutant, wondering if he/she now has to speak faster or leave out some slides to bring the show back on time. During my time at CSM, I gave a course on mineral processing to the final year degree students which was 40 hours. I also covered the same field with first year mining students in 5 hours, and to schools in 30 minutes. No matter what the subject, you should be able to tailor a talk to a stipulated time. You may have noticed that when referring to the arrogant presenter, I used 'he' throughout. For some reason this appears to be a male dominated impairment and I can't recall one of our female presenters falling into this trap. Maybe they practice their talks in advance, to get the timing right. PIM '10 closed today at lunchtime. Unfortunately we had two 'no-shows' today, both authors from Iran. One had the courtesy to email us to advise of a flight cancellation, but we have heard nothing from the other. At the last minute, one of our presenters from Istanbul Technical University withdrew his paper, much too late for a replacement from one of our poster authors. Nevertheless this has been an interesting conference, our first in Turkey and a very different atmosphere from most MEI Conferences. The event seems to have been used primarily as a meeting place and there has been a great deal of group discussions in the extended coffee breaks and the long 4-course lunch breaks. Amanda closed the conference and announced that the next meeting, Processing of Industrial Minerals & Coal, will be held at the same venue in June 2012. Jon opened Processing of Industrial Minerals '10 this morning. Quite a few delegates arrived late, due to the horrendous early morning traffic in Istanbul. Jon introduced our consultant, Prof. Guven Onal, of Istanbul Technical University, who talked about Turkey's considerable mineral reserves, located mainly in Anatolia. The country is a major producer of industrial minerals, notably of borates, chromite, feldspar, marble and clays, as well as significant amounts of coal. During the first, extended, coffee break, delegates had the opportunity of discussing the 8 poster presentations with the corresponding authors. Snow overnight and Istanbul looking very different today. Spent the morning at Topkapi Palace (photo below) before returning to the hotel to prepare for the late afternoon registration at Processing of Industrial Minerals '10. Greetings from a very wet and cold Istanbul. This is my 5th visit to this fascinating city, Jon and Barbara's 2nd, and Amanda's first. This morning Jon and I met up with the conference manager of the President Hotel, where Processing of Industrial Minerals '10 will begin on Thursday. We have 59 delegates registered at the moment, our latest, from Saudi Arabia, bringing the number of countries represented to 14. More delegates are expected to register on Thursday. After the meeting Jon and I met up with Barbara and Amanda at the wonderful 6th Century Aya Sofia (left). Then onto the Grand Bazaar, to buy things that we didn't really want, before returning to the hotel to dry out.